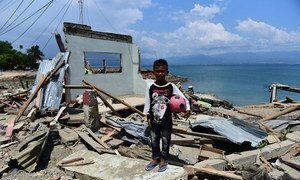 Standing amidst the wreckage of Balaroa, one of the worst hit areas of Palu, Indonesia, on Friday, UN Secretary-General António Guterres said it was “impossible not to feel heart-broken” at the destruction caused by the huge earthquake and tsunami that struck the island of Sulawesi two weeks ago. According to news reports, the village of Balaroa, virtually disappeared into a sinkhole due to the earthquake and around 70 per cent of the population lost their lives. Latest figures from the UN humanitarian affairs office (OCHA) say that around 2,000 died overall in the disaster, with 11,000 injured and 680 still officially missing. “Their courage, their spirit of solidarity is remarkable” he added, saying that the response led by the Indonesian government had been “very rapid and effective”. Among the locals he met, were those recuperating at a Palu hospital, which had been partly destroyed in the disaster. He talked to some of the displaced who had either lost their homes, or were now too afraid to return. He also met families who had lost loved ones, as well as schoolchildren and their teacher, in a camp in Jalan Balaikota. Secretary General António Guterres singing along with children who have been affected by the recent earthquake and tsunami in Palu, in the Indonesian island of Sulawesi. 12 October 2018. In several tweets from Palu, the UN chief had this message for locals across the devastated city and surrounding area: "To the many people I saw and spoke to - your strength and resilience are remarkable. The UN is with you." 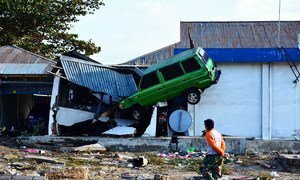 "I was deeply saddened to see so many people suffering in Palu amidst so much destruction," he wrote. Mr. Guterres travelled to the region with the Indonesian Vice-President Jusuf Kalla, and also met the Head of the Indonesian Disaster Management Authority, and governor of Central Sulawesi. On Saturday, he's taking part in World Bank-International Monetary Fund meetings in Bali, where he's discuss sustainable development and climate change. Watch the latest video below from the UN humanitarian affairs office, OCHA, on the scale of the recovery effort that lies ahead. UN Secretary-General António Guterres, has called for Governments across South-East Asia, to take a lead in the fight against global warming and the damaging impact of climate change. Following the series of devastating earthquakes, tsunami and landslides on 28 September in Indonesia, the death toll has risen to 2,010, with around 10,700 seriously injured and nearly 700 still reported missing, according to United Nations agencies on Tuesday.